JSC Day 3: Why does government prefer representation by white male lawyers? This week’s Judicial Service Commission interviews have concluded with the recommendation of two senior counsel to serve as judges on the Eastern Cape bench. One of the issues aired on the final day of interviews was the reluctance of both private practice and government to appoint black lawyers to appear for them – which experts say continues to delay transformation in the judiciary as well as the legal profession. By REBECCA DAVIS. Bloem told the JSC that in his experience, work was much less frequently passed on to black legal practitioners than to their white counterparts. 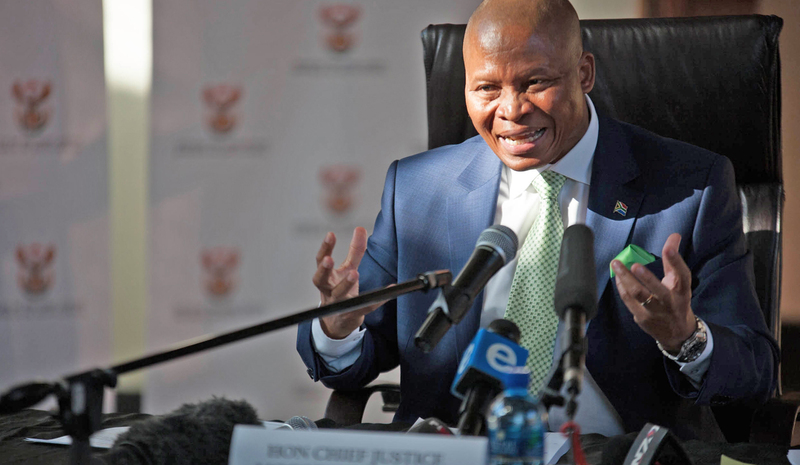 Chief Justice Mogoeng Mogoeng stressed that this was a serious problem. “Nobody talks about briefing patterns,” he said. You don’t have to be intimately involved in the South African legal scene to have noticed that in some of the most high-profile court cases over the last few years, black senior counsel has been invisible – even when the client being represented is the government. This year, Parliament has thus far been represented in two cases by Advocate Jeremy Gauntlett and in one by Advocate Wim Trengove. It’s an issue that Judge Dennis Davis chose to deal with on the latest edition of his eNCA debate show, Judge for Yourself. As Davis pointed out, it’s not just a question of the lion’s share of significant legal work going to white lawyers. There’s also the fact that this has an impact on the future makeup of the judiciary: “The more experience people gain at the bar, the more experienced they become for the bench,” Davis said. Advocate Dumisa Ntsebeza – chairperson of Advocates for Transformation and a JSC commissioner – has been calling for change in this regard for some years. In March this year, Ntsebeza again expressed unhappiness, this time with Parliament’s choice of white male counsel. He told City Press that it was “unbelievable that the office with the highest authority in the legislature apparently thinks the only way to win cases is to appoint white advocates”. On Judge for Yourself this week, Ntsebeza repeated his assertion that government has a special responsibility in its hiring practices because it is the largest consumer in the country of all services, meaning that by definition a great deal of legal work stems from it. Justice Minister Michael Masutha responded that although the government was the biggest consumer as a single client, it was not the biggest sector. He added that the Justice Department had a good track record of distributing work to previously disadvantaged groups. Later in the show, the Minister said that a number of policy interventions would be put through Cabinet later in the year “to give effect to some of these transformation initiatives”, including revamping the office of the state attorney. The Institute for Accountability’s Paul Hoffman suggested that the government favoured white counsel for reasons of competition and efficiency. “It’s certainly not cost-effective to choose for yourself an advocate who you have no confidence will win the case for you,” Hoffman said – a viewpoint which Davis subsequently termed potentially offensive. “You’re looking to win the case, you’re not looking to try out untried counsel,” Hoffman continued. Hoffman also said that the pool of available and experienced legal practitioners continued to have too many white participants in it, and too few black participants. The problem is not restricted to government; it afflicts the private sector too. Minister Masutha suggested that in some cases what is at the root of it is racism, and a lack of trust in black abilities. “You find black successful captains of industry who still…despite they themselves having succeeded being black, don’t have confidence in other blacks,” Masutha said. Davis dubbed this “Margaret Thatcher syndrome” – an apparent reference to the former UK Prime Minister’s failure to meaningfully empower other women. Ntsebeza urged government to push the private sector to change their briefing patterns, saying it should be incumbent on white senior counsel to bring in black and female counsel. Back at the JSC interviews on Wednesday, Advocate Bloem got his nod from commissioners for appointment on the bench of the Eastern Cape High Court, together with fellow senior counsel Selby Mbenenge. Earlier this week, judges Nambitha Dambuza and Rammaka Mathopo were recommended for the two vacant Supreme Court of Appeal positions. Judge Mampuru Makgoba won the recommendation for the position of judge president of the Limpopo High Court, and Judge Achmat Jappie earned the nod for the KwaZulu Natal judge president position. If President Jacob Zuma accepts the JSC’s recommendations, it will mean that no white candidates succeeded in their bids for positions; but also only one woman. On Wednesday, the JSC announced that the hearings for the new permanent member of the Constitutional Court will be held on 9 and 10 July, with the deadline for applications closing in just over a week. Legal advocacy groups have already expressed concern that this may be insufficient time to persuade able female candidates to make themselves available.